RSVP closes in just a few days, do not miss out! 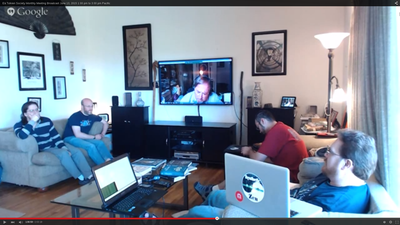 This setup let us mix Skype and Google+ Hangout simultaneously, but doesn't have green screen features. It is also a more casual seating arrangement. Though it will be rearranged to allow for the much larger convention audience attendance. 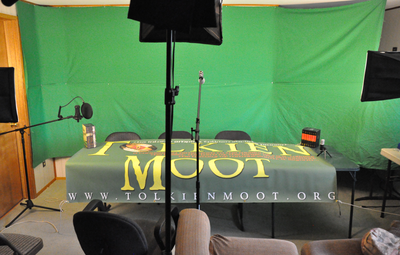 This photo is from our monthly Tolkien Society meetings/broadcasts. The second broadcast room has a green screen setup that allows images to show in the background. For example, in the setup above, when we were trying to show the map, I had to move the camera up to the TV. While with the green screen, it can show up in the background behind the speakers. This setup is only able to use Google+ Hangout however. Looking forward to seeing you all soon at Tolkien Moot XI! RSVP Closes Wednesday, July 15th. Conference begins Friday July 17th.